This adorable new white cotton blend batiste bonnet is made by Rosalina, a leading designer of classic smocked children's clothing. It is detailed with a band of white smocking accented by green embroidered shamrocks. 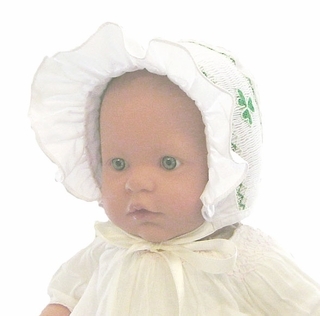 It has a closed crown and a soft gathered ruffle to frame baby's face. The bonnet ties under the chin with satin ribbons. 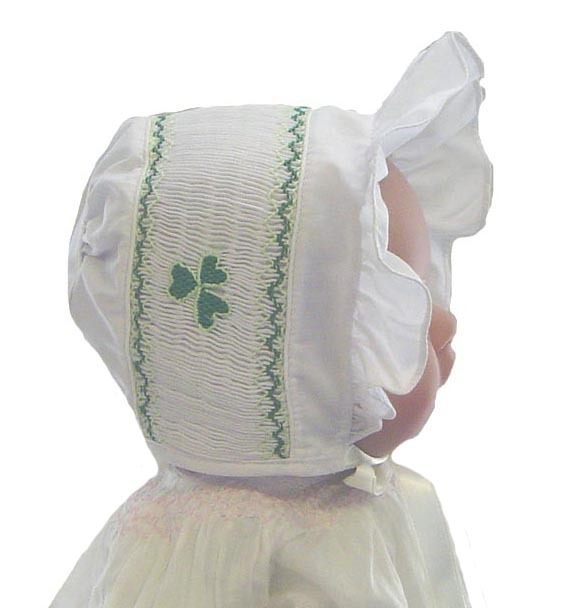 Perfect for a christening bonnet for a baby with Irish heritage, for a St. Patricks Day bonnet, or for a take home bonnet or baby shower gift for your little Irish lass! Note: Matching shamrock smocked shoes are also available. See below.